Leonard Gardner is the author of one of the finest sports novels ever written, Fat City, a masterpiece of the terse style that is, in the words of Denis Johnson, “so precisely written and giving such value to its words that I felt I could almost read it with my fingers, like Braille.” Gardner also wrote the occasional magazine piece, like this one for Sport magazine, published in 1972. In the Eagles Gym on the second floor of an old green building in a residential part of Vancouver overlooking the bay, there were so many spectators they had to be cajoled into giving the man they had come to see space enough to punch the bag. They scurried after him for autographs on his way to the shower, and, barred from joining him in the stall, they waited until he emerged in his terry-cloth robe and surged with him to his dressing room. Locked out, they milled restlessly, gazing at posters of past fights covering the walls and at advertisements for the Muhammad Ali wristwatch on sale behind a counter. All the cameramen were leaving and the reporters that still remained were clustered around Ali’s buoyant trainer, Angelo Dundee, a short man with dark protruding eyes, modish clothes, and hair combed artfully forward, who was giving his consideration to a theory that Muhammad Ali was the greatest athlete of all time. “He could have been a great track man or a baseball player, and he’s tall enough for basketball,” said a newsman in a green plaid suit and a homburg graced with a band of exotic feathers. When Ali came out in his street clothes—a blue warmup outfit—his face bored and still boyish at 30, he paused to comb his hair before accepting the pens and paper. With Dundee and his entourage he was pushing slowly toward the stairway when someone said, “George is here.” At this cue Muhammad’s face came alive. His eyes widened; his head, up above most of the other heads, turned from side to side. George Chuvalo’s dressing room was at the head of the stairs, and Ali began to beat on the door. “George, you in there?” He leaned in and winked at Chuvalo, who was sitting in the crowded room in a pair of pale lavender undershorts. “George, I’m coming in to get you.” He winked again, as if to make sure George understood it was a game or to persuade him to play too, but George just sat there. “Don’t let him in,” prompted Dundee. And then Ted McWhorter, Chuvalo’s trainer, a frail, taciturn black man in old clothes and wornout suede shoes, on whose face every worry of 40 years of boxing seemed to have left its mark, dutifully came forward. “Go on. Get away. You can’t come in here. George in here,” he said sadly. But Muhammad pushed his way in and locked the door. Grinning, he screamed threats, grunted in imaginary struggle, pounded a wall, kicked the door. Then he opened it and let McWhorter shove him out to his delighted fans. George remained in his chair, unamused. Now a timid knock sounded on the door, and two give-away color photos of Ali were passed in. “Guy want to know will you sign these,” said McWhorter. It seemed a rather insensitive request of one whom the sports pages were calling the forgotten man in the coming bout, but George obligingly scrawled “Keep punching” and his large, elaborate, illegible signature over them. Whatever vanity he may once have had seemed to have been burned out of him in the combustion of millions of calories and the fire of 86 battles. Known for his stoicism, he combined extremes of energy and repose. It was a quality peculiar to the ring, demanded by it, and seemed now the heart of Chuvalo’s personality, as if profession and character had become one. It had served him well for 16 years; but now it was being suggested that stoicism might be all he had left. He was approaching 35. The subject of retirement had been opened in 1967 when a beating by Joe Frazier hospitalized him with a fractured eye socket. In 1970 a battering by George Foreman appeared to convince both his critics and his fans that the long rugged career had come to an end. But it didn’t convince George. No one yet had ever knocked him down. Eleven days after the Foreman match he was fighting in Yugoslavia, his parents’ birthplace; and now, two years later, his refusal to quit had become a part of his image. Muhammad Ali works out at North West Eagles Hall in North Vancouver in preparation for his 1972 rematch with George Chuvalo. Photo by Sal Veder/AP. McWhorter secured the handwraps and adhesive tape and we all stood up. “Are there many people out there?” George asked. Half the crowd and all the newsmen had gone. Chuvalo had the whole gym floor for his spirited shadowboxing. His stablemate, Clyde Gray, warmed up with him. Gray was scheduled to fight Manny Gonzalez on the coming card. A leading contender for the world welterweight title, he would normally have been a substantial favorite over an aging Gonzalez, who had once been near the top but now had the dismal look of impending defeat; but this would be Clyde’s first contest since the death of his brother, Stewart Gray, from injuries sustained in a bout in Winnipeg several weeks before. Clyde was now a somber presence in the Chuvalo camp. He admitted he had no more zest for boxing and was going on only for the big money that seemed at last to be near his grasp. McWhorter was laying out the headguard, Vaseline, mouthpiece, cup, and gloves for George’s sparring. He had come out of Alabama, trained fighters for many years in Detroit, and lived now in a Toronto hotel across the street from the Lansdown Gym. He was a bachelor of 57 and wore a small mustache. Serious, circumspect, shifty-eyed, he had little tolerance for questions and distractions and seemed at times to brood, as if the tensions of his fighters were being deposited in him and in his ritualistic care of the details of training. He had the concentration of one fending off disturbing influences, and even put up an alarmed struggle against a girl who tried to coax and then drag him into posing for a photo with George. She had to settle for a picture without him. His mind was on bringing George into the fight at the peak of readiness and after seven weeks of training the two said as one that George was in the best shape of his life. McWhorter was not talking retirement. The next morning the two men were running in the park on a narrow path along the edge of the bay, under redwoods, firs and flowering dogwood, past totem poles and floating ducks, past a group of young white-clad runners going the other way, George setting a brisk pace, a look of exhilaration on his face, his mouth open to the cool air that had a sharpness and purity suggestive of the snow on the mountains just across the water. Drover ran a few yards behind, partly bald, with a little fat shaking at the waist, his nose prominent and askew, his face slightly quizzical, as if at 28 he faced questions the older man ahead of him could ignore. “I guess they think you’re taking too many punches,” I said. That was another subject he had to contend with. Some sportswriters called him a catcher and he was sensitive about it. I asked if his wife, Lynn, was still pressuring him to retire. She had become something of a sports page personality with her tears and her pleas of “stop it!” when George went through some of his more difficult evenings. I had heard of scenes in dressing rooms where she begged for a promise that the fight about to begin would be his last—perhaps the reason she was home in Toronto now with the children. Open and animated, he spoke without self-consciousness, the words coming so rapidly they sometimes ran together in the way he spoke. Croatian. Not long before he was reading The Ring he had learned his English in the streets of The Junction district of Toronto, and now he began telling about those days and about his parents. Before his father’s immigration the family name had been Cuvalo—watcher—a name from the days when Croatia was ruled by the Turks and his ancestors, serfs, had been herders, sheep watchers. The generations of Cuvalos that followed remained poor country people. George’s father grew up on a farm. At 10 he suffered a broken arm that his uncle advised against setting so the boy might avoid military service. He grew up with an arm he was never able to straighten and was drafted anyway. Back from the army, he married, and six months later left for the opportunities of Canada with the intention of saving the money for his bride’s passage. It took him 10 years. He cut wood in northern Ontario, labored on road gangs. A year after his wife finally arrived, George was born in Toronto. He spoke of his mother now with fondness and appreciation, describing her as having been extremely warm and loving, a woman five feet eight inches tall and weighing 200 pounds, yet not fat, structured with his own thickness of bone and muscle, who during her noon hour would run the mile from her job as a chicken plucker to his school in order to give him a kiss and a bag of potato chips. His father was of a different nature, rough and stern, a man of 68 now, who walks over 10 miles a day and whom George still kisses good night. At 10 George had four amateur fights and thought he was too thin. When he returned to the ring at 15 he was a heavyweight. He left school that year for the packing house where his father worked. After a year he had had enough of butchering and returned to high school, where he felt his classmates were snobs and was self-conscious about his clothes. He kept to himself, lifted weights and boxed, and at 17 was Canadian AAU champion. At 19 he was a professional, living restlessly in a basement apartment with a 15-year-old wife. In his debut he had entered a novice heavyweight tournament in Toronto and won it with four knockouts in one night. That established him as a hometown attraction, but it wasn’t conducive to an unhurried development of skills. His handlers appeared to think they had a born champion; in his next appearance George was thrown into a main event with the champion of South Africa, Johnny Arthur. Though it was Arthur’s 35th fight, Chuvalo came out with the decision. Nine bouts later he was in over his head against Bob Baker. At 21 he was ranked 10th in the world, and at 24 he was desperate. He had lost half of his last 10 bouts. He had four children, no job, no money, a mortgage he couldn’t meet on a house he called a matchbox; he was borrowing from his mother-in-law, at odds with his manager, dissatisfied with his trainer, discouraged with his style, and unable to get a fight. When he failed as a used-car salesman, he borrowed $5,000, bought up his contract and went to McWhorter in Detroit. Durability could compensate for crudeness only so far. McWhorter gave him the tools suitable for his strength—a bobbing, weaving attack, short punches, counters, combinations. After a few more fights under his own management, George went to Irving Ungerman, who could give him the backing he needed. Their partnership took him through 10 popular years as a top contender. Ungerman, a poultry processor whose father had employed George’s mother, was waiting now in his suite in the Vancouver Hotel for George to appear with him in a television interview. He was short, a former amateur flyweight, hyperactive, excitable, dressed in stripes, wearing sideburns, smoking a cigar. Chuvalo called him “The Noise.” He was his first fighter and Ungerman relished the role of manager. He had not collected a percentage of George’s earnings since 1969, when they had agreed that year was to be George’s final one in boxing and so he should take with him out of the sport all that he could. The arrangement had persisted, said Ungerman—who by repute had no financial worries anyway—because he had kept thinking that each additional fight was going to be George’s last. He made no secret about wanting him to retire. Ali and Chuvalo ham it up for reporters during signing ceremonies in New York. Promoter Murray Pezim is caught in the middle. Photo by Marty Lederhandler/AP. “Win, lose, or draw,” he said now to the camera, “I just hope for a fine showing.” The cigar went back into his mouth and George leaned toward the microphone. Now somebody wanted a still photo and George got up and locked Ungerman in a strangle hold. That evening George and I struck out for Chinatown as if pursued by McWhorter, who lacked George’s liberal views on diet. We walked at a pace close to a run, and it was clear that to Canadians on the street George was no forgotten man. People kept turning to look at him; a number of men wished him luck; one managed to keep up with him long enough to grasp his hand. “Are you who I think I am?” the confused policeman asked. As George was writing “Keep punching,” another officer, evidently alerted by radio, roared up and dismounted with his pad. The first policeman escorted us into the restaurant and led the way to the table he decided should be ours. As the fight approached, the desire for Chinese food began to take George over. After dinner he would go for a walk with Drover and Gray and return sometimes wet from a sudden rain to his room to sit in his shorts and talk until after midnight. His T-shirts—one with a picture of Donald Duck on the chest—and sweat pants hung over the backs of chairs to dry. A pair of hand grips, jars of vitamins and honey were on the dresser. On the bedside table was a copy of Boxing Illustrated and a magazine called For Men Only. He called room service for orange juice and tea, commented on their exorbitant prices but added that the promoter was paying for them. At Ali’s hotel, the Georgia, where a nightly promotional party was in session, one heard that Chuvalo didn’t have a chance. One reporter suggested he be retired with a lifetime supply of Empirin. It provoked a dispute about the state of George’s head. The reporter was a specialist in auto racing. I lacked the knowledge for a discussion of radial tires, so the conversation dwindled to silence over the carcass of one of Irving Ungerman’s turkeys. Maybe Ali knew about radial tires. He drove to the gym in a bronze Ferrari and talked about everything else. He said he was stepping up his training fight by fight so that he would hit a peak in his return match with Frazier, which Dundee had been saying was as good as set. He said he was the resurrection of boxing, that he wanted to cross the Alps on elephants, that his enforced layoff was the best thing that had happened to him, because it got him friends all over the world, and that he was going to be the first man to put Chuvalo down. Then he scuffled with Ungerman, whose mock punches, all low, seemed to betray a desire to fight the man himself; and he beat on George’s dressing room door as usual. The door was divided in the middle into two sections, with a shelf over the lower half. The top half flew open and George came diving out over the lower half, his face wild with rage. The shelf broke as his ribs came down on it; his legs shot up; and if McWhorter and others hadn’t caught him he would have tumbled head first to the floor at Ali’s retreating feet. “I can make myself think I’m mad in a second,” he said, touching his ribs. “How do you know you’re not?” I asked. He went out and broke the steel swivel on the speed bag. At the weigh-in on the day of the fight both men were so subdued that the most colorful character at the ceremony turned out to be a preliminary fighter named Jimmy Nobody from Nowhere, who announced to anyone who cared to listen that he would rather be a nobody going somewhere than somebody getting nowhere. The promoter, Murray Pezim, told the crowd of newsmen gathered around the scales that he was happy to bring this great fight to Vancouver, a statement received as an admirable show of gameness. This was Pezim’s first venture into boxing and had required guarantees of $200,000 to Ali and $65,000 to Chuvalo—the largest purse of George’s career. Pezim, whose previous experience had been in securities, had said earlier that Ungerman got him drunk one morning and talked him into this bold enterprise. But he said he might even do it again. This kind of gracious resignation with which he faced what everyone seemed to agree was going to be a loss of at least $100,000 had given him a poignant charm. The Georgia Hotel had been filling with men of a peculiar sameness of appearance, who stood in the lobby in double-knit sport coats, patterned shirts, and zippered boots, looking jaded, mysteriously affluent, cynical and exhausted; and they were upstairs now in the hallway outside the room where the weigh-in and the medical exams were taking place. Pezim spent much of his day in the lobby. Another man out of his element at the weigh-in but who seemed to be enjoying it more was Dr. Joe Greenberg, just in from Toronto—the Chuvalo family doctor for many years and, more recently, George’s cut man. A gentle, patient, gray-haired general practitioner with an elegant weariness, he discussed George from a medical point of view. We went out into the morning rain behind Ungerman and McWhorter and some of George’s friends, and as we trailed them around the street, the doctor explained his presence in boxing as a response to a need. “Take a nosebleed. To stop a nosebleed you apply pressure.” He grasped the bridge of his nose. “Yet I’ve seen seconds poke swab sticks up nostrils and stir them around. Somebody once showed me Whitey Bimstein’s secret formula for cuts. You couldn’t even clean it out afterwards.” Then he revealed his own treatment for cuts—Whitehead’s varnish, used many years ago in surgery. While McWhorter moodily selected gauze pads and a 16-ounce jar of Vaseline, the doctor criticized the use of smelling salts in sports. Chuvalo entered the ring in purple trunks and robe, followed by McWhorter in his run-down suede shoes. The Pacific Coliseum was filled only to half capacity, but the cheering was loud and excited and it rose again as Ali came down the aisle a moment later. The day before, Ali had run 3½ miles and worked 10 rounds in the gym, most of them tirelessly circling the ring, and now at the bell he went back into that same bounding dance, one way, then the other, his arms dangling at his sides, presenting that wide-open but unreachable target that gave his fights their fascinating tension and his opponents so much frustration. George, walking after him, trying to cut the ring off and corner him in accordance with the pattern of his own training, held his guard high and blocked most of the few jabs Ali threw. He even landed some of his own. He appeared confident, and in the second round landed a hard right cross to the side of Ali’s head as he was pulling away, but the jabs were thumping him more frequently now and he was beginning to swell. George was pacing himself, wasting no punches, and though Ali was conscious of pace too, his legs seemed exempt from the laws of fatigue. He danced on and on, up on his toes, shifting, fading back, always in motion and going with the punches, his muscles soft and relaxed, his left snapping out from the hip, swift and accurate, yet with a look of negligent ease. George blocked it when he could. He bobbed and weaved—not always enough to satisfy Ungerman, who constantly shouted defensive advice from the corner. He ducked, but his ducks were forward leans that he tended to hold a little long, and Ali had been practicing uppercuts. George was taking punches, but he was conducting a disciplined fight against as fast and elusive a heavyweight as the sport has possibly ever known. 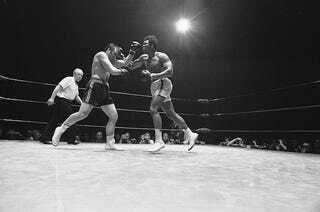 And though behind all the way as he had to be, he did at times trap Ali on the ropes and explode with the combinations to body and head that the distance between the two men had been forcing him to keep in check. But in the open ring his fleeting opportunities reduced him mostly to single punches, and he threw too few of these. And always that long left was thumping his face. He cornered Ali in the fifth and jolted him with hard blows to the head, but the advantage slipped from his control: Ali lay back on the ropes, beckoned him in and dropped his arms. While the crowd yelled for George to go in and Ungerman yelled at him to stay out, George balked. It was a moment that seemed to go on and on. Ali even stretched his arms out on the ropes, and George’s refusal of this dream opportunity, clearly a trap, but dangerous for Ali as well, was like a psychological turning point, establishing each man’s degree of confidence. George knew Ali could beat him to the punch, and Ungerman knew it too. Later Ungerman was to say: “I just didn’t want him to get hurt. He shouldn’t be looking to get in the big one because he wasn’t going to anyway.” And so George backed off, only to go on with his pursuit as soon as Ali went back into motion. In the next round he was battered by a torrent of combinations and emerged with a deep vertical cut over his eye that provided more than an ample test of the staunching qualities of Whitehead’s varnish. After that the fight was Ali’s. George walked into the stream of jabs and hooks with no less courage or resolve, but soon Ungerman was shouting to him just to last it out. In his far comer after the eighth round, the pressure showing on his face, George bellowed an enraged curse at his seconds because, he said later, they were all yelling at him at once. It seemed also the curse of a thwarted will. At the press conference Ali said it was a lie that Chuvalo was washed up. He said he had hit George with his best shots, and George said he enjoyed the fight. In the dressing room while George took a long steaming shower, McWhorter drained the plastic flask of emergency brandy from the medical kit. Wearing a pink knit shirt and a soiled suede jacket, George rode with friends to a hospital for stitches, stopped at a pharmacy for pills to reduce swelling, and went on to a party at Ungerman’s suite, where the television was on for the fight news, McWhorter kept his hat on, and Ungerman urged his guests to eat more turkey. “So the fight’s over,” someone said. “My last fight’ll be with my wife,” replied George. “I raise 175,000 turkeys a year,” said Ungerman. Ungerman flew home the next day. George stayed on with McWhorter, who was transformed into an expansive man in a new red check sport coat, new hat, and pressed gray slacks, talking about a vacation in Acapulco. He went with George and his friends to a night club that evening, but they never got around to discussing Acapulco. George spent most of the time at another table, talking to a promoter about a fight. Leonard Gardner is a novelist, journalist, and screenwriter. Fat City, his perfectly realized boxing novel, was taught by David Milch when Milch was a creative teacher at Yale. Later, when Milch went to Hollywood, Gardner wrote over two dozen scripts for him on NYPD Blue.